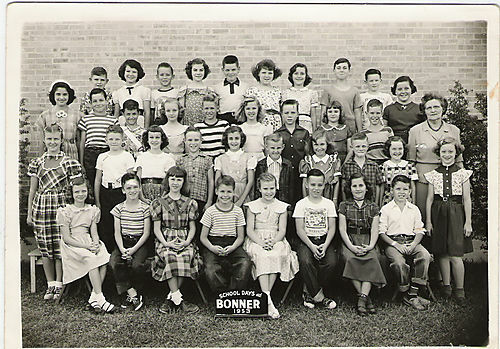 Glenda Burns Minniece sent these two Bonner Class Photos (our first from that school!). Said Glenda, "Mrs. Steed was our 5th grade teacher. She read to us every day after lunch. That's how I learned about The Black Stallion books among other goodies." Glenda also included the following alphabetized list of her elementary classmates who graduated with us in the Milby Class of 1960, but she said that not all of these students are in both pictures. See if you can match the names with the faces. Thanks, Glenda!!! TO RETURN TO THE TOP OF THE MAIN SECTION OF THE BLOG, click on "milby1960.typepad.com" at the top left of this album, in the gray bar.